Xplore micro injection moulders with a shot volume of 5.5 or 12 ml can easily sit on your laboratory bench or in a hood. Our IM 5.5 and IM 12 machines fit seamlessly with our twin-screw compounders to streamline your R&D screening. They can also work as stand-alone units to mould formulations that do not require mixing. 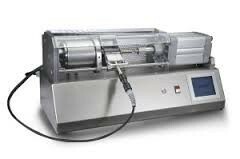 The Xplore micro injection moulders allows you to test and evaluate new or expensive materials and formulations in a very reliable, reproducible, fast and cost-effective way with very small amounts of test material. The core of these laboratory micro injection moulders consists of a temperature controlled mould housing for a conically shaped mould, in combination with a heated, removable injection nozzle unit. The divisible, conically shaped mould is fitted into the housing in such a way that opening during injection is prevented. As a result flashing of material belongs to the past. Compounded material is injected into the temperature controlled mould with a plunger powered by compressed air. Holding pressure and time are controllable to avoid shrinkage of the moulded test sample. The mould is then removed from the machine and opened by hand. The injection unit is easily removable and can quickly be filled by either compounded material directly from our micro compounder or manually with powder or granules.